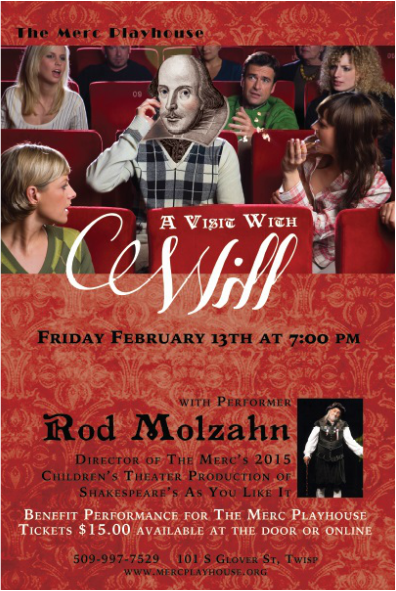 Rod Molzahn has been bringing Will Shakespeare to life for audiences throughout the United States and Canada since 1986. He performs regularly in theatres, schools, universities, faires, and festivals. His CD recording of A VISIT WITH WILL has received Awards of Excellence for Writing and Creative Concept and for Characterization in the performance of Will Shakespeare from The Communicator Awards. Rod is currently directing The Merc’s Children’s Theater Production of As You Like It.Tickets $15.00 for adults. $5.00 Youth 18 and under. Proceeds benefit The Merc Playhouse. Tickets can be purchased on the Merc Playhouse Website, or at the door. Doors open 30 minutes prior to show time. receive 20% off regular ticket prices.